Osprey family at Lynnhven Inlet, VA.
Now, the Chesapeake Bay plays host to the largest breeding population of osprey in the world. At last count there were more than 10,000 breeding pairs throughout the bay region. Lukei and Matthews counted 74 nests with breeding pairs this summer in their part of Virginia alone. But, they say, many of the young in those nests, built on navigational markers and specially constructed platforms in the water, didn't make it. "We found 33 nests out there that the young disappeared from," said Matthews. "And we suspect, based on what we've seen, that great horned owls are playing a part in the loss of young in these osprey nests." To illustrate, Lukei held up a plastic bag containing the leg of a baby osprey. It still had the purple band he put on it in June. "We band on June 9 and it was found on June 13," he said. "We know that (an owl is) the only creature that's going to be able to pick up a two-pound bird off a nest in the water and fly to a tree and devour the chick." Biologists in Maryland are reporting the same problems. Two-thirds of the nests failed at Solomon's Island and about half failed upriver at Patuxent River Park. Greg Kearns, a naturalist at the park, says weather was a big factor, with heavy winds and rain early during the hatch period, along with owl and crow attacks. "The owls seem to be adapting this behavior because there's so many osprey nests now," he said. "I think the great horned owl is finding that it's easy pickings." On Poplar Island, in the upper bay, U.S. Fish and Wildlife Service biologist Peter McGowan says half of the 23 nests have failed since 2014. He says one reason for the decline is weather. "We’ve had two cold and wet Mays in a row, which is a crucial part of the incubation period." And another reason is an increase in predators. "We've also been seeing an increase number in fish crows on the island." Bryan Watts, who heads the William and Mary Center for Conservation and Biology considers predators a secondary problem. He points to studies that equate a decline in menhaden, a key fish in osprey diet, to low reproductive rates. "It's like the old story of people blind-folded and putting their hands on an elephant and seeing different parts of the elephant," he explains. "So there are different factors that are influencing osprey reproductive rates in different places, so people have their own perspectives, but their localized perspectives. What we need is a larger system-wide perspective. And I think that what you'll see is that food stress is the dominant issue." 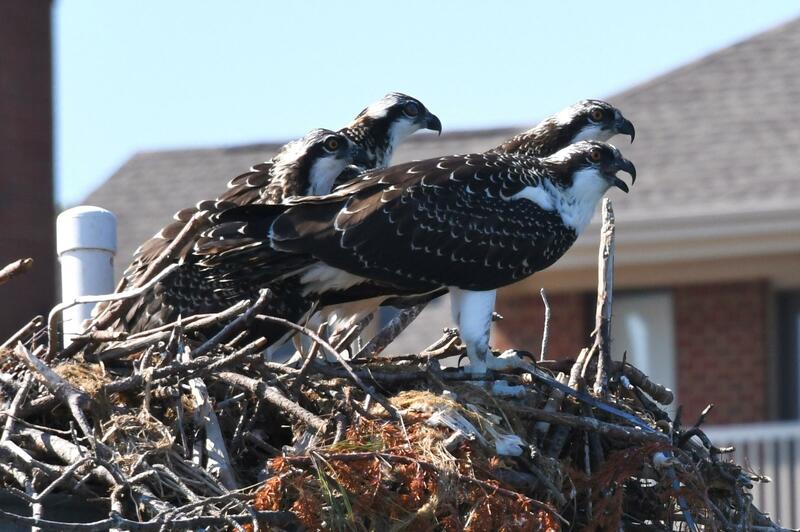 The Atlantic States Marine Fisheries Commission is to consider the impacts of the menhaden fishery on species like the osprey during it's next stock assessment in 2019. And on a recent trip, Kirsten Webb and Hayley Hartman were visiting Roland and Sheilah Bradshaw at their home on Smith Island. Kirsten was hardly into her opening spiel about community response to flooding when Roland jumped in. Dr. Helen Bailey, who did her PhD work on bottle nose dolphins, says she heard reports of occasional sightings of the marine mammals when she came to work as an associate professor at the University of Maryland’s Center for Environmental Science in Solomons. But then the underwater microphones the lab was experimenting with began picking up the tell-tale squeaks and clicks of dolphins foraging in the Chesapeake and its tributaries. Now, the scientists are finding out the dolphins are pretty regular visitors to the bay. "We were discovering that we were actually detecting dolphins quite frequently during June, July and August," she said. "And so then put another hydrophone in the Potomac River and there we were detecting dolphins every day." A bipartisan array of state officials went to bat for the Chesapeake Bay yesterday, lobbying their Congressional representatives to restore $73 million in bay restoration funds that was chopped out of the 2018 federal budget.